Handmade from 100% recycled materials, a festive Autumn inspired new journal & pencil set! Features my original illustration of fall leaves, acorns and flowers in shades of peaches, corals, oranges, pinks, teals and maroons with a light peach background. 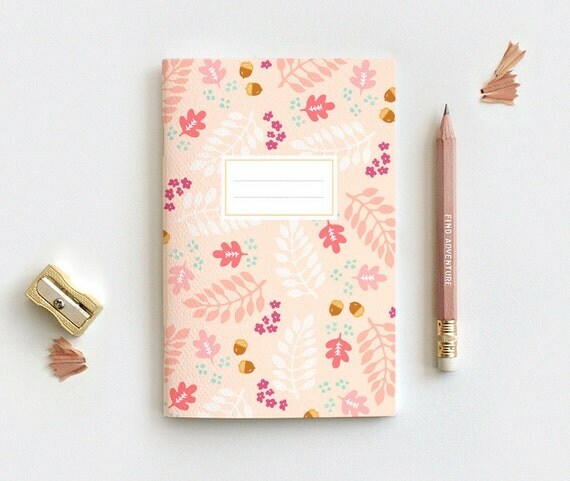 A white box in the top center with two dotted lines, perfect for you to write a name or date. Available in 3 sizes, with blank, lined or dot grid inside pages. An upcycled paper pocketbook, no page is the same, a real joy to write in and take notes.